Humans have be obsessed with the prehistoric past since the birth of modern science. Since the release of the fourth Jurassic Park movie, Jurassic World, dinosaurs have stepped back into the limelight. These dino inspired treats and eats are perfect dinosaur lovers or future paleontologists. These dinosaur sugar cookies are a buttery, slightly sweet cookie with the slightest hint of vanilla flavor. To make the fossilized foot print, a toy dinosaur is used. A small detail, such as the footprint, transforms ordinary sugar cookies into something special. A dinosaur cookie cutter is all you need to create this fun bento box. These long neck dinosaur sandwiches are decorated with red pepper and cucumber spikes. They are served with dino teeth (cut cucumbers) and dino eggs (cut kiwi). This long neck dino cake is a foolproof recipe that is ideal for beginning bakers. Boxed yellow cake is trimmed to look like a long neck dinosaur before it is covered in green frosting and decorated with yellow candy. 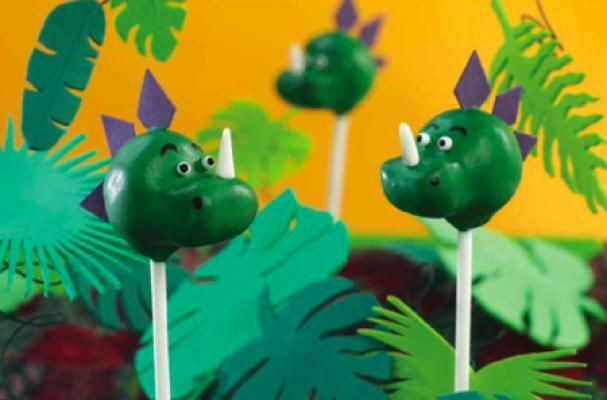 Dinosaur cake pops are a great project for bakers who have a wild imagination. Since no one really knows what dinosaurs looked like, it is left to your own interpretation. Be playful and creative with these pops; you can even invent your own dinosaur species.